Compact Fluorescent Light Bulbs (CFL)are simply miniature versions of full-sized fluorescent light bulbs. They screw into standard lamp sockets and are available in a variety of styles or shapes. Some have two, four, or six tubes. Older models and specialty models have separate tubes and ballasts. Most common today are the circular or spiral-shaped tubes. 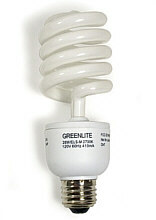 A CFL is a very energy efficient lamp and have become popular. A concern is that a CFL bulb generally contains an average of 5 mg of Mercury (about one-fifth of that found in the average watch battery, and less than 1/100th of the mercury found in an amalgam dental filling). The net benefit of using the more energy efficient lamp is positive, and this is especially true if the mercury in the fluorescent lamp is kept out of the waste stream when the lamp expires. Handling, Recycling, and Disposal of CFLs —The mercury in compact fluorescent bulbs poses no threat while in the bulb, but if a CFL breaks the mercury can be released into the environment. Proper handling and a prudent recycling effort will help reduce the effects of mercury in the environment. CFLs are made of glass and can break if dropped or roughly handled. Be careful when removing the bulb from its packaging, installing it, or replacing it. Always screw and unscrew the lamp by its base (not the glass), and never forcefully twist the CFL into a light socket. If a CFL breaks in your home, follow EPA's online EPA light bulb recycling or call EPA Region IX: (866)-EPA-WEST or (415) 947-8000. The technology exists to separate the glass, phosphor powder, mercury and other materials in CFLs for recycling, but there is not yet a convenient system for bulb collection. However, there are a few local recycling programs and in June 2008 The Home Depot launched a national in-store CFL bulb recycling program at all U.S. The Home Depot locations. In the absence of the local recycling programs or The Home Depot program, residents and businesses should check with their local municipality, waste hauler, or take their spent fluorescent lamps to a household hazardous waste collection center. Disposing of a CFL should be the last resort. Businesses should contact the University of Nevada, Reno, Business Environmental Program for provisions based on their generator status. Although household CFL bulbs may legally be disposed of with regular trash, they are categorized as household hazardous waste. As long as the waste is sent to a modern municipal landfill, the hazard to the environment is limited. Another solution to disposing in the regular trash is to save spent CFLs for a community household hazardous waste collection event, which would then send the bulbs to facilities capable of treating, recovering, recycling, or properly disposing of them. For more information on CFL disposal or recycling, you can contact your local municipality. Again, businesses should contact the University of Nevada, Reno, Business Environmental Program for provisions based on their generator status.